You’ve all heard the bedtime story of Cinderella: a pretty girl is placed in the care of her wicked stepmother and stepsisters after the death of both of her parents. She has no friends, except for her strange acquaintances with animated animals. One day, the kingdom announces a ball and the wicked step-trio refuses to allow Cinderella to go, so she relies on a mysterious fairy godmother to give her a stunning dress, carriage, and petite glass slippers. To cut the long story short, she meets a hot prince, falls in love, and they get married and live happily ever after. 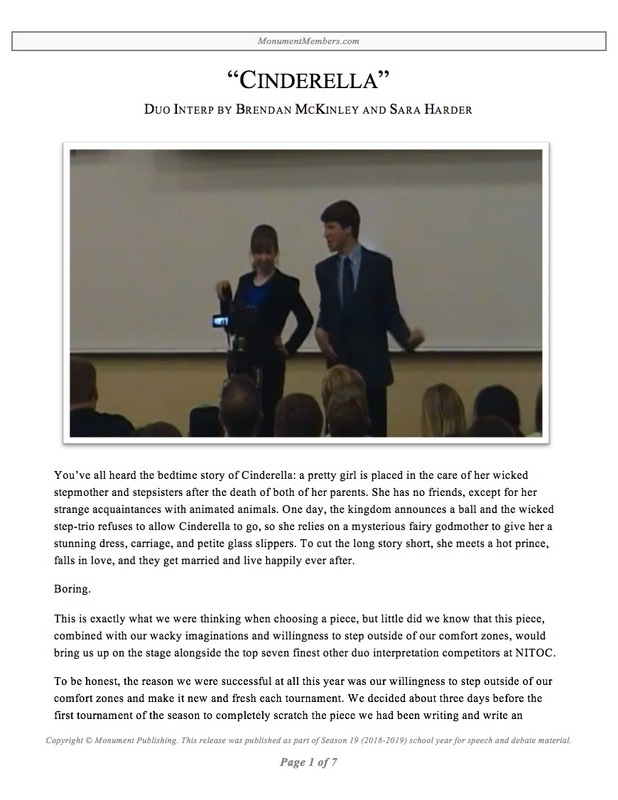 This is exactly what we were thinking when choosing a piece, but little did we know that this piece, combined with our wacky imaginations and willingness to step outside of our comfort zones, would bring us up on the stage alongside the top seven finest other duo interpretation competitors at NITOC. To be honest, the reason we were successful at all this year was our willingness to step outside of our comfort zones and make it new and fresh each tournament. We decided about three days before the first tournament of the season to completely scratch the piece we had been writing and write an entirely new one. Two days before the tournament, we got together and blocked the piece. For the tournament, we had rooms packed full of people to watch our zany rendition of a beloved tale. We were shocked when we broke to semi-finals, even more shocked when we broke to finals, and the shock had shocked our socks off (try saying that ten times fast) when we placed third.